Join us to witness the unveiling of Nancy's Howllywood makeover, have the chance to be on national television, and help Full Moon Farm! Nancy has been selected to receive a makeover for a new and upcoming show. (Sorry, but we can't tell you the name!) The show features two popular reality designers who have been featured on a popular design show. They will be creating an outfit especially for Nancy to wear to her Pawty. The Pawty will take place on Saturday, September 4th from 4:00 - 8:00 p.m. The $25.00 cover for this event will benefit Full Moon Farm. Come listen to some live music, enjoy a glass of wine from RayLen Vineyards & Winery and hors d'oeuvres from small, local restaurants. Full Moon Farm will also be giving out their Volunteer Appreciation Awards. Attendees are requested to wear nice, but casual attire. All attendees will be required to sign a confidentiality agreement. To RSVP, please call 828-664-9818 or email Sarah Hallback at sarah@fullmoonfarm.org. As of this writing, 9 of the 38 animals still need homes, and we are out of time. If you are able to take an animal or two, please contact Nancy. We also need assistance picking up fencing. Nancy loaned out her trailer and it was returned to her broken. We also need help putting up pens at the Farm. Donations of fencing, a bumper pull trailer and/or work on the 4WD mechanism on Nancy's truck are greatly appreciated. If you can help, please contact Nancy at nancy@fullmoonfarm.org. Photo courtesy of Rebecca Wright. On Monday, August 2, 2010, the Henderson County Board of Commissioners voted to ban wolves and wolfdogs in their county, citing the belief that the rabies vaccine is ineffective in wolves and wolfdogs. (For those who live outside this area, Full Moon Farm is in Buncombe County, a few miles from the Henderson County border.) The county claims that they will not go in and seize animals unless complaints are filed, and no animals will be euthanized unless they are injured or ill. They say they will work to find placements for seized animals in sanctuaries outside the county. Animal control officers will be the ones determining whether or not the animal has wolf content, and say they will be using a genetic test to determine this. One place immediately affected by this ban is Night Song Refuge in Zirconia. Full Moon Farm will be taking in two of their wolfdogs, and Nancy has been working with them and county officials to help place the rest. Nancy wishes that Henderson County officials had contacted her for information prior to enacting this ban. She maintains that the only genetic test available costs between $1,000 - $5,000 per test, and it is not available to the general public. 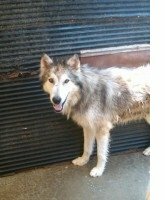 She wants to work with their Animal Control officers to educate them on wolfdogs, since it is too easy to mistake northern breeds for wolfdogs. Nancy is concerned that, with this new law going into effect, as many as 100 wolfdogs in Henderson County will be rendered homeless. Full Moon Farm has already been contacted by wolfdog owners wanting to know how this law will impact them. The efficacy of the rabies vaccine in wolfdogs has been debated for more than 10 years. Studies have been done, following USDA guidelines, and they showed that the rabies vaccine was effective in wolfdogs. In 1998, the USDA deemed the rabies vaccine was effective for all members of Canis lupis familiaris, the classification used for dogs and wolfdogs. Under their own standards, once a vaccine has been approved for members of a species, the vaccine is then approved for all members of the species. The USDA approved the rabies vaccine for use in wolfdogs in 1999, but tried to reverse their decision in 2001. This month, it's Wraith and Sophia! These two have been paired up since October 2008. They're both incredibly social and friendly. They've been learning how to properly take treats and walk on a leash! Wraith is a little more retiring of the two. While affectionate, he's been known to make you "work" for his attention by not coming up right away. He's also our "Emo Woofer," as he's prone to sulking if Sophia is hogging the spotlight. Sophia is a total sweetheart, and cannot wait to greet visitors. She's been known to jump up and plant her paws on your chest so she can wash your face. She'll also climb over Wraith if it means getting to her visitor faster. Wraith is not amused by this behavior. These two are in need of a new pen. Sophia figured how to get out of their old one She managed it twice within 20 minutes, but didn't get far either time. They're currently residing in a temporary pen near Dodger. If you can help with building them a new pen, please let us know! Photo of Dean working with Sophia & Wraith courtesy of Sharon Greene. The Valdese Downtown Merchants and the artists who performed at the June benefit concert. Greenlife Grocery in Asheville for selecting Full Moon Farm for their July Bag Donation Program. Mayfel's in downtown Asheville for selecting us as one of their "Dog Days of Summer" recipients. The Swannanoa Shindig, for allowing us to have a table at their event. USA Rafting for donating the two-person pass for us to raffle off. The Ingles #8 in Black Mountain for donating beverages for our July Howl-In. Manna Food Bank for donations of short-dated and mis-packaged meat. Carolina Bison for donations of buffalo meat. And all the volunteers who have helped clear debris and worked on pens. We are grateful for everything that you all have done! Photo of Nancy & River at the Benefit Concert in Valdese courtesy of Sharon Greene. A soon-to-be-published book on human-animal interactions titled Some We Love, Some We Hate, Some We Eat: Why It's So Hard to Think Straight About Animals has a chapter on human-dog relations. 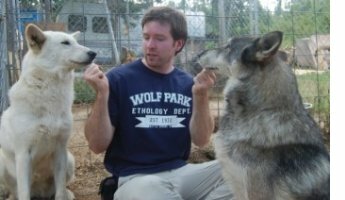 The author, Hal Herzog, spent some time at Full Moon Farm observing the wolfdogs and their interactions and interviewing Nancy. Her work is featured in that chapter. The book is scheduled to be released on September 7th. The publisher describes it as "[a]lternately poignant, challenging, and laugh-out-loud funny, this enlightening and provocative book will forever change the way we look at our relationships with other creatures and, ultimately, how we see ourselves." Reviews of the book have been very favorable, and are available here and on its Amazon page. We would like to thank Mr. Herzog for taking the time to come to the Farm, and for including us in his book! Our next Howl-In is Saturday, August 21st. Tours of the Farm start at 3:00 p.m. Potluck supper begins at 5:00. $5.00 donation includes main dish and soft drinks. Bring a side dish and join the fun! Photo of Harley howling courtesy of Michele Frankl. We are looking for a few good, civic-minded people who would be interested in serving on our Board of Directors. Non-profit experience is required, along with fundraising and/or volunteer recruitment experience. If you are interested, please contact Nancy at nancy@fullmoonfarm.org. Thank you! We are in need of volunteers who are able to help out with chores at the Farm, or at events and fundraising activities. If you are interested in volunteering, please fill out the application here, and our Volunteer Coordinator will get back to you. Thank you for your assistance! We are looking for vendors/artists/craftspeople who would be willing to donate items and/or services for our Annual Auction on October 7th. If you are able to help with this, please contact Sarah Hallback, Events Coordinator, at sarah@fullmoonfarm.org. We are grateful to everyone who donates their items to help our animals. The Animal Rescue Site's Shelter+ Challenge is still going on! You have until August 22nd to help Full Moon Farm win a 10,000 grant. Simply go to The Animal Rescue Site and "click to give" (the big purple button). Then click on the "Vote Today" button at the top of the page. On the next page, you'll type in "Full Moon Farm" for the name of the shelter and "NC" for the state. After you click the "vote" button, you will be taken to a page with a picture of an animal. Once you type in what it is and click "submit," you're done! Please remember to vote daily. Every click helps! And thank you! We'd also like to remind you to please consider using igive.com for your online shopping, and GoodSearch for your online searching!